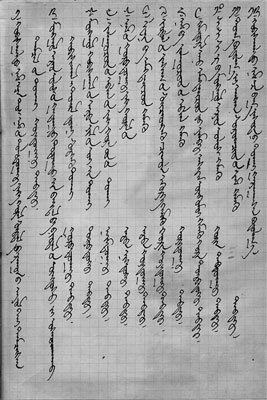 A sample of Mongol bichig in manuscript form. The top character on most of the lines are numberals. A note:In looking at the site’s statistics, I had noticed that the single most common search phrase that brought people to the site was “Mongol bichig.” Then, typing “Mongol bichig” into Google, I found that the first two links returned are to my site. So I thought I’d put up a short essay on Mongol bichig more generally, for people who are looking for it. Mongol bichig itself means Mongolian writing. What people (almost) always mean when they refer to it is the form of Mongolian writing based on Uighur. It is sometimes referred to as the “old script” or “vertical script” in Mongolian and even in English. Mongol bichig is said to have been established by Chinggis Khaan, who commanded a Uighur captive in 1204 to adapt the Uighur alphabet for Mongolian. (Charles Bawden, somewhere in his history of Mongolia, drops a comment that he thinks Mongols had writing before then, but he never develops the idea.) It is a vertical script, which is read top to bottom and left to right. (Go to the section of this website that has documents in bichig to download to see a bunch of samples). It is an alphabet with 30 different letters. (This includes letters developed specifically for foreign words. A more “core” listing of letters commonly used would number 22.) A friend of mine argues that Mongol bichig should really be seen as a syllabary, since once you learn the independent letters you invariably write and read bichig in terms of syllables, rather than individual letters. And she has a point. It also has a ‘native’ number system, although in publications in bichig from Mongolia, by the late 1930s or early 1940s, this was replaced by Arabic numbers. TOday it seems kind of hit or miss on who uses which number system. In Mongol bichig, each letter has three forms – an initial, medial and final – depending on where in a word it occurs. The writing system is ambiguous, with, for example, “t” and “d” being written with the same character. Certain forms of “o” and “ö” (among others) are also written the same. However, certain constraints of Mongolian – such as vowel harmony – mean that the ambiguities are not as bad as they seem at first. Spelling and grammar are different in bichig than they are in Cyrillic. Usually, but not always, there are specific patterns to the differences. Long (double) vowels in Cyrillic, for example, are almost never double vowels in bichig, but certain set patterns. Thus, what is written Ulaanbaatar in Cyrillic would be written Ulaganbagatur in bichig. (I’m not worrying how to transcribe the different Gs and such right now.) In a similar manner, grammar differs between the two versions of Mongolian, but actually tends to be more systematic in the old script. It should be pointed out, however, that the Cyrillic spelling and grammar much more closely reflects how Mongolian is actually spoken in Mongolia. The degree of difference was once explained to me as being as different as Chaucerian English is to modern English. I’m not sure this is totally accurate – in some ways the vertical script has more differences with the Cyrillic than the analogy would suggest and in other ways, it has fewer. Still, it gives a good comparison. Bichig is still used in Inner Mongolia in China. It was used until the middle of the 20th century in independent Mongolia. In the mid to late 1930s, Mongolia briefly flirted with using the Latin alphabet. This never really took. In 1941, Mongolia officially switched over to the Cyrillic alphabet. In actuality, the switch did not occur until the early 1950s, and even then, documents and reports in the archives are often written in bichig. Mongol bichig once again became popular after 1989, and is now taught in schools. In the early 1990s, there were plans to convert back to the old script as an official writing form, but this was never realistic. Bichig today is used mainly in advertising or other ornamental purposes in Mongolia, where people tend to use it to proclaim “true Mongolness” or convey a sense of something being “traditional” (whatever that means).